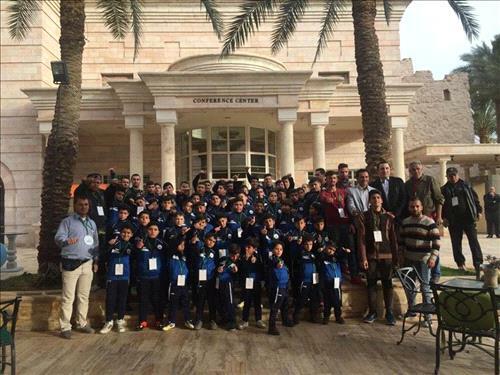 AMMONNEWS - On Thursday, January 24, 2019, Mövenpick Resort & Residences Aqaba and Movenpick Resort & Spa Tala Bay opened its doors to 75 orphans from the Mahhata Orphans Welfare Charity Society, who enjoyed a full day of activities and a pleasant lunch Buffet. The friendly gathering was arranged in collaboration with the Jordanian Hashemite Fund for Human Development (JOHUD) and Princess Basma Community Development Centre (Aqaba). This activity is a reflection of the two Movenpick Resorts in Aqaba firm belief in the positive impact that the direct interaction with community members has on developmental growth. Mövenpick's hosted ths event inline with its sense of belonging with its surrounding environment, and acting on the strong sense of social responsibility it holds towards fellow citizens. From his end, General Manager of both Mövenpick Resort & Residences Aqaba and Movenpick Resort & Spa Tala Bay, Mr. Dan Benzaquen said, "It is our role to shed light on the needs of orphans and to allow them to participate in a diverse multitude of activities, as such inclusions are a national, humanitarian and a developmental duty"